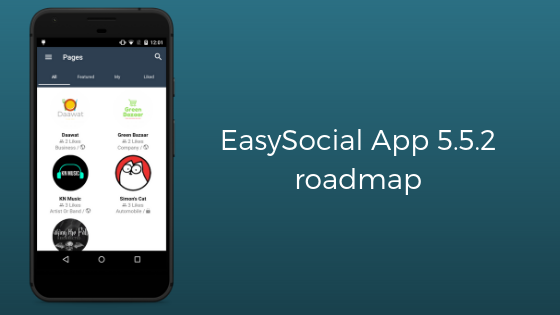 Know what's coming in EasySocial App 5.5.2! We have begun working on the next release of the EasySocial app - v5.5.2. In this release we are focussing on adding a key feature that users have been asking - allowing profile editing. Also, the stream being one of the most seen and viewed section of the app, we want to improve the usability of the stream. From 5.5.2, the user will be able to edit the profile information. We plan to do this via 2 separate links. The “basic information” i.e. name, email id and profile picture can be changed directly via the app. There will be a link to edit the full profile that will open the profile edit screen in a web view which will allow users to edit the full profile. The stream and the sharing controls on the stream page are easily one of the most used features in the app. We want to make this experience as simple as possible. There are some niggles in this screen as of today that we are working on addressing. At the same time, we also request users to list their top pain points on the stream / sharing that you would like to see fixed in the app. Do let us know your feedback for any issues and UX improvements related to the stream and sharing in the comments section of the blog so that we can include them in the release. Monday, 24 September 2018 Know what's coming in EasySocial App 5.5.2! Tuesday, 10 July 2018 EasySocial App 5.5 is here! Jticketing Event Manager App v3.2 is here! Google Login comes to EasySocial App in version 5.3.3!